The recent stock-out of a hormone used in gender-affirming treatment for transgender men following soon on the heels of a stock-out last year of the primary hormone used by transgender woman, has revealed a system-wide neglect of a large sector of the South African population. KARIN SCHIMKE reports. Transgender men, who require testosterone as a chronic medication for gender-affirming treatment, were caught unawares by a stock-out of Depo-Testosterone earlier this year. No one seemed to know, or be prepared to fully communicate, the reasons for the stock-out, when the problem would be resolved properly, and whether it would reoccur. The shortage of the hormone is described as life-threatening. The transgender population has a high incidence of suicide and the changes wrought by the sudden cessation of treatment has dire effects, not just on the men’s transitioning bodies and their endocrine systems, but on their mental health. Seth Deacon, a transgender man, said that, as is often the case, the transgender community had been left to seek their own solutions to their unique problems. Information and support are shared on social media. Psychologist Elliott Kotze, a transgender man, said that some of the problems in the healthcare system, both private and public, was that gender affirming treatment and surgeries were classified elective and cosmetic treatments, rather than life-saving care. Deacon said transitioning was difficult and financially taxing in numerous ways. There are currently only three public hospitals that provide care for the transgender community: Steve Biko, in Pretoria, Chris Hani Baragwanath in Johannesburg and Groote Schuur in Cape Town. Last year, due to training done by, among others, GenderDynamiX, Nelson Mandela Hospital in Mthatha did its first gender reassignment surgery. People who do not live in those provinces, cannot access care from those hospitals’ special units, and those who live in the provinces and do want the surgery, have to add their names to lists so long, they’ll be lucky if they have their surgeries done within 25 years. Not everyone opts for surgery, but even just getting the correct hormones or any other support services, is extremely hard, including for those people who lives in metropoles. GenderDynamiX health advocacy officer Linda Zakiyya Chamane says transgender people in rural areas have almost zero hope of getting any support at all for their needs. Dr Anastacia Tomson said: “Transgender populations are neglected by a number of areas in society, but especially or very prominently by the health care system. This group of people has very specific needs — not complicated needs, just specific needs — and those are underserved. Deacon said: “There are NGO’s and individual doctors in the public and private sectors who are sympathetic and helpful and provide support, but not enough of them. It occurred to me, as I was chatting to friends online, that it is important for us to advocate for ourselves. “Very little is ever achieved without a mass movement of people — and I use ‘mass’ in inverted commas when it comes to the transgender community for various reasons, not least of which is that to be openly transgender is hard. People are genuinely afraid to come out. We have this one issue now, the stock-out of Depo-Testosterone, but there are lots of issues. Transgender people and their allies — including parents, medical practitioners and representatives of NGO’s — met and formed #Unite4TransRights in February. 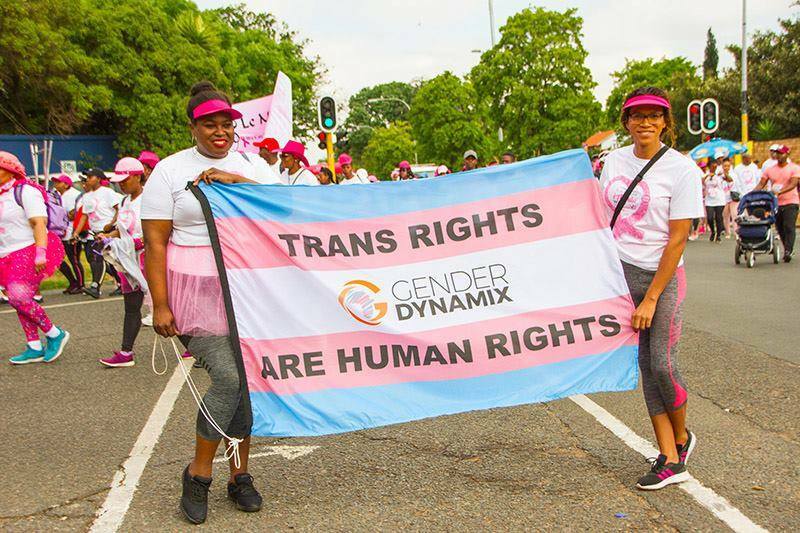 The group, endorsed by NGO heavyweights such as Treatment Action Campaign, SECTION27, Be True 2 Me, Triangle Project and GenderDynamiX, sent out a statement to the media outlining their demands. They called not only for a clearer response from Pfizer, who supplies Depo-Testosterone, about the stock-out and the planned remedies, but also the National Department of Health to respond to the crisis “and put pressure on Pfizer to uphold their commitment to provide healthcare to its clients” and to “ensure that gender affirming hormones can be accessed at all primary healthcare facilities, including in rural areas”. The statement also asked for national and international LGBTQI+ human rights organisations to show solidarity, and a revision of healthcare policies for transgender, non-binary and intersex communities. On 19 March, the Psychological Society of South Africa (PSYSSA) had a Western Cape launch of its Practice Guidelines For Psychology Professionals Working With Sexually and Gender-Diverse People which was printed last year. The only other guide for health professionals that exists is The Adult Trans Gender Patient: A Guide for General Practice: Hormone Transition Therapy, published by GenderDynamiX. That guide is out of date, however, and Dr Tomson, along with Dr Elma de Vries, who compiled the first guide, is currently updating it. There are no national Department of Health endorsed standard treatment protocols or guidelines, said Kotze. Dr Tomson said: “We are having these conversations amongst ourselves, but we need mainstream society to have this conversation. We need people to understand what the difficulties are and how easily they’re fixed. How many people are transgender, non-binary or intersex and in need of treatment? This is almost impossible to say, even internationally, because of stigma and a real threat to people’s safety if they come out. But, said Dr Tomson, overseas figures indicated that transgender people generally made up about 0,5% of the population. “That means, that if you have a room of 200 people, there’s at least one trans person in that room,” she said.